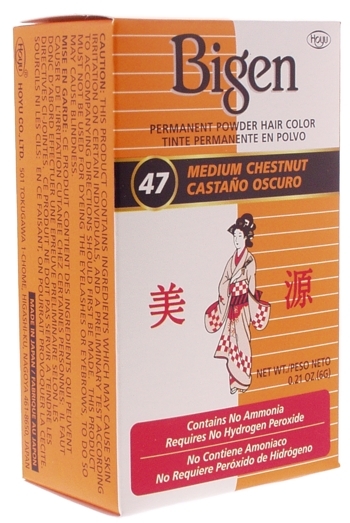 This is a popular Japanese product ideal to cover gray softly thanks to its formula. Bigen contains neither AMMONIA nor HYDROGEN PEROXIDE. Its beautiful and true-to-life color lasts longer than conventional colors. Bigen gives the hair a smooth silky and shiny look. Easy to use - just mix with room temperature tap water. Bigen does not require Hydrogen Peroxide. 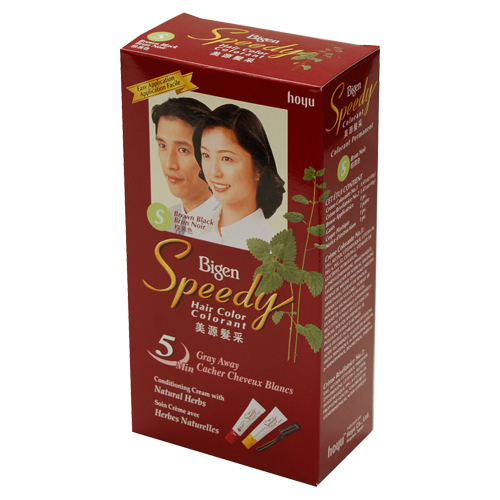 Bigen is lightly scented and contains NO AMMONIA. Directions: For adults only. For external use only. Pour color powder into a cup or bowl. Add tap water at room temperature. Then quickly apply mixture to the dry hair with a brush. After 10 minutes, check your color by wiping a strand with cotton every few minutes until the desired color is achieved. Rinse hair and then Shampoo well. For re-touching, you can use only the necessary amount, save the remainder for your next application. *As with any hair coloring or dye products, please follow instructions carefully. *This product contains ingredients that may cause skin irritation on cert individuals a preliminary skin test for 48 hours prior according to accompany directions should first be made. This product must not be used for dyeing the eyelashes or eyebrows. To do so may cause blindness.